I spent all of yesterday afternoon melting some onions and tomatoes for a tortilla. It takes time for onions to melt into an incomparable sweet savoury fondant and more time for tomatoes to transform into a sticky palate stinging jam. Luckily I can afford it. Saving has never been in my remit but somehow I have amassed an enormous reserve of time. I have certainly wasted enough of it but but it seems to have been replaced by my high interest rate. Melting onions can be very well behaved which good behaviour they displayed yesterday. Owing to these paragons I was able to avail myself of another slice of time savings to recreate a summer salad that had impressed me when I first saw it on a wonderful blog – http://mapleandmiso.com/2014/06/24/courgette-with-tahini-yoghurt/ – that I urge you to visit. 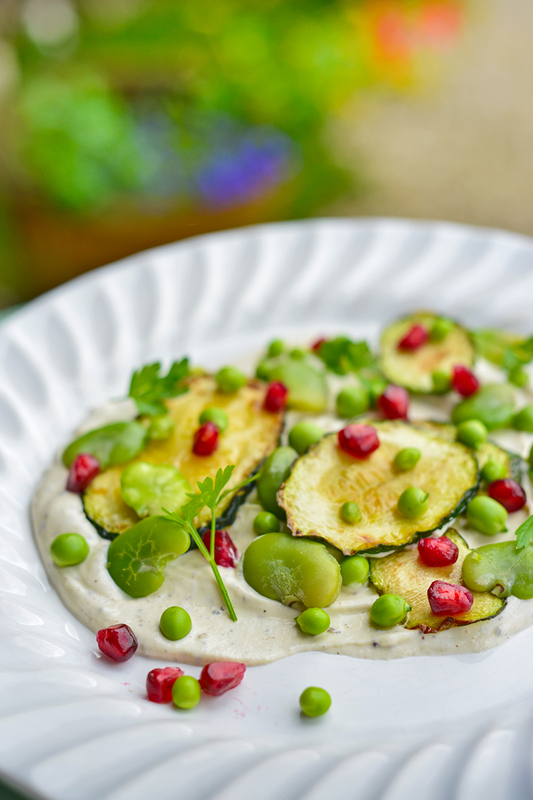 Although the dish in Maple and Miso’s blog travels under the name of Courgette with Tahini Yoghurt, it’s the fresh peas and broad beans that initially caught my fancy, along with the outrageously silky combination of greek yoghurt, tahini, sumac and olive oil. 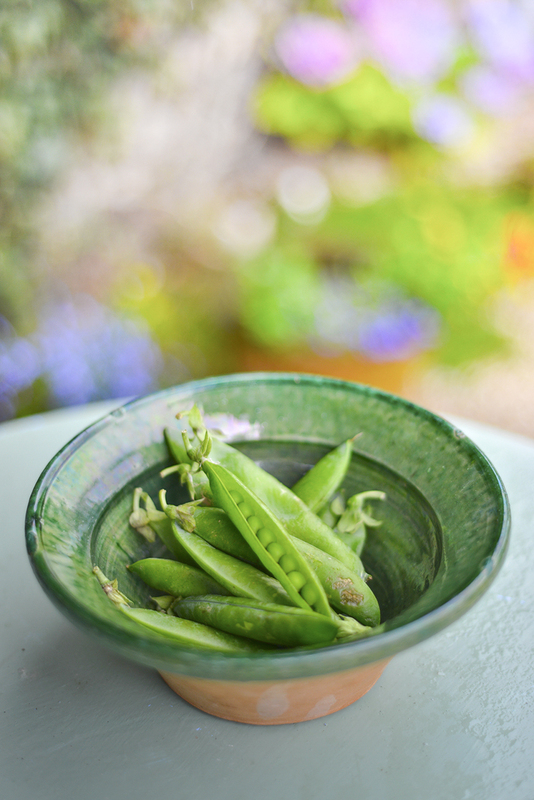 Over the passing years I had lost faith in fresh peas which, on each occasion that I had eaten them, never seemed to have retained the sweet pea taste of my childhood memories. 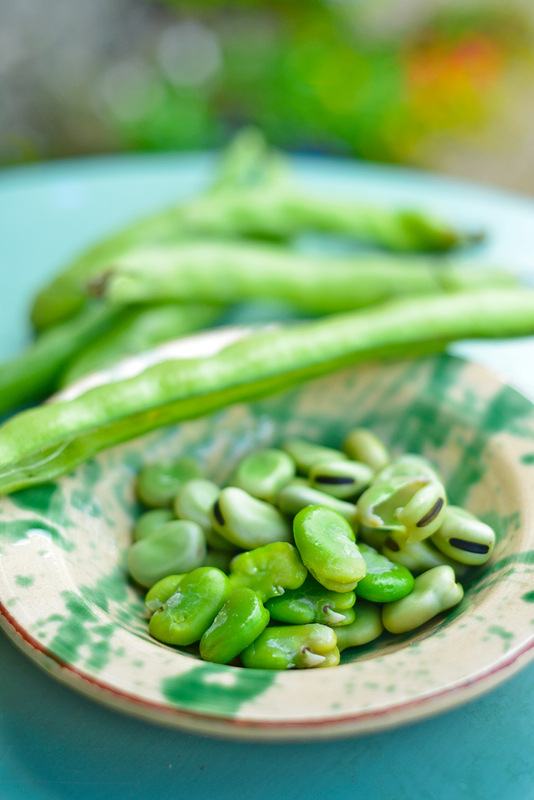 However, I relented and bought a handful of fresh peas and the same of broad beans together with the first pomegranate that I have bought since God was a boy. A pomegranate in the hand is worth sending all your clothes to the dry cleaners in the vain hope of removing the stains. However, in the back of my mind rang clear the words of none other than Andy Harris, that doyen of pomegranate seed removal. “Cut the bugger in half and whack it on the back with a wooden spoon”. Unbelievably it worked like magic. The perfect little jewels shot out of their shell and landed harmlessly in the bowl beneath. I could have been dressed in a white Dior sheath dress and no one would have been any the wiser about my close encounter with the stain of pomegranate juice although pomegranates would not be the first concern if such an encounter were to occur. This salad was so much more than I had expected. I strongly recommend that you go to the blog of Maple and Miso for the recipe….and for all their other delicious recipes. This entry was posted in 2014, Andy Harris, Art photography, beans, Cookery Writers, Digital photography, food, Food and Photography, Food photographer, France, Fruit, Garden, Herbs and Spices, Olive oil, Pea Pods, Peas, Photography, pomegranate, Recipes, Shopping, Sumac, Tahini, Uncategorized, Vegetables, Writing and tagged Andy Harris, Childhood memories, clear thinking, cooking, delicious confection, digital photography, food, Food photographer, France, Fresh peas, Humour, natural beauty, paragon, Photography, Photography course, pomegranate, pomegranate juice, recipe, Salad, social networking, Summer, Tahini, Time rich, Tortilla, Vendee, writing. Bookmark the permalink. Love this Roger, as always your food and photos are works of art. Such staging style you have. I’m afraid my salad would never be so lovely. Yes my tables are OK, but my food photo skills stink! I keep trying to get it right. Yes, yes and yes again. Good things in good bowls. The French really do a fantastic job of preserving – I went to the house of a couple in Normandy (ten years ago) and they had a huge basement with extra kitchen and amazing bottling/canning equipment. I’m still in awe! The stuff on sale in supermarkets for bottling and canning is very impressive and not expensive. This looks like a work of art! It all looks so fresh, and I love how the pomegranate pops on the plate. Time, that mysterious and sometimes elusive element of alchemy. My eyes are eating the salad… and I’m pleased no white sheath dresses were harmed in the creation thereof. Oh what a delightful looking salad. I wish I had some of you enormous reserve on time…that would make this salad all the more enjoyable. I love the way you say, “melting onions” that’s indeed what it is. Happy French Summer to you, Roger. Superb salad from a very interesting blog: I wish I would have found a way to subscribe!! Homework for later 🙂 ! Time or lack of it . . . . ? I live in a diametrically opposite world to you in having 36 hours of ‘must-do’s’ for every 24!! Have to think about this . . . . would I add to my contentment if I simplified my many ‘desires’ . . . . hmmmm!!!! Miso & Honey is indeed an interesting blog. The two protagonists both came and did one of my Food Photography Workshops. I think their blog will just get better and better. I adore fresh peas. Your photos are stunning. Your salad looks so delicious. Emma. That looks quite delicious. As per time, while there is never enough of it, it seems, it’s still important to take all the time you need. Grow the beard and the money will pour in, boy. If Nigella Lawson captivated the masses eating pasta in a negligée, the world could be your oyster!